Milk-based cocktails have been staples of the bar scene for hundreds, if not thousands, of years. Popular favorites like the White Russian or the holiday classic Egg Nog are time-honored classics, but both are known for their heavy, creamy consistency. Milk punches, particularly the clarified milk punch, offer the complex flavor and smooth mouthfeel of milk-oriented cocktails, but without the heaviness associated with such drinks. Clarified milk punches were developed in the early 18th century as a method of preserving drinks. Here, clarification refers more to a technique than a specific cocktail recipe, as there are dozens of similar mixes in cultures spanning the globe. Clarified milk punches are sometimes referred to as “English milk punches” as a nod to their origin. To clarify a milk punch, milk is mixed with an acidic ingredient like citrus juice. A chemical reaction occurs, curdling the milk. Once the mixture is strained, the result is a clear cocktail that has the flavor of milk but with a much more subtle tone than heavier milk cocktails. 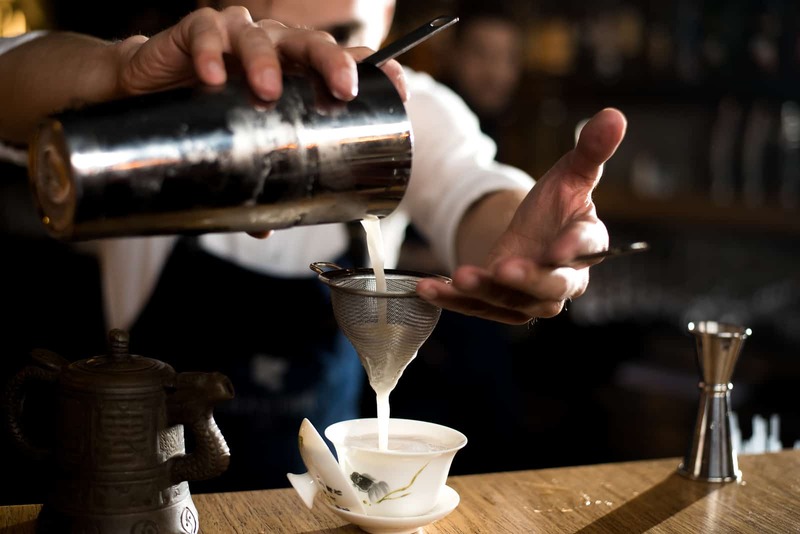 In recent years, professional bartenders can be found exploring this technique, adding their own unique spin to the milk punch with regional or seasonal ingredients. One of the emerging favorites is the Oaxacan Clarified Milk Punch, which introduces drinkers to mezcal, a relative of tequila. Mezcal is characterized by woody and smoky notes, serving as a counterpoint to the sweet flavors of the cocktail mix. This recipe takes some preparation and is not something most bartenders can whip up on the spot. With the extra preparation, however, the result is a satisfying cocktail with complex aromas and notes of smoke, spice, and a tropical essence. This recipe makes a large batch, perfect for your next gathering. Combine the chunked pineapple, water, sugar, salt, mezcal, and elderflower liqueur in a container. Mix thoroughly and store for 36 hours in the refrigerator. After 36 hours, remove the mixture from the refrigerator and stir in the lemon juice and heated buttermilk. The mixture will curdle. Allow to sit overnight, then strain the mixture twice through fine cheesecloth to remove the curdled milk proteins. To serve, pour the mixture into highball glasses and garnish with a dusting of coconut powder.